New Braunfels (/ˈbrɔːnfɛlz/ ( listen) BRAWN-felz) is a city in Comal and Guadalupe counties in the U.S. state of Texas, located in the northeastern part of Greater San Antonio. It is the seat of Comal County and 32 miles (51 km) from Downtown San Antonio. The city covers 44.9 square miles (116 km2) and has a 2017 estimated population of 79,152. New Braunfels was established in 1845 by Prince Carl of Solms-Braunfels, Commissioner General of the Adelsverein, also known as the Noblemen's Society (in German: Mainzer Adelsverein). Prince Solms named the settlement in honor of his home of Solms-Braunfels, Germany. The Adelsverein organized hundreds of people in Germany to settle in Texas. Immigrants from Germany began arriving at Galveston in July 1844. Most then traveled by ship to Indianola in December 1844, and began the overland journey to the Fisher-Miller land grant purchased by Prince Solms. At the urging of John Coffee Hays, who realized the settlers would not have time to build homes and plant crops further inland before winter, and as the German settlers were traveling inland along the Guadalupe River, they stopped near the Comal Springs. Prince Solms bought two leagues of land from Rafael Garza and Maria Antonio Veramendi Garza for $1,111.00. The land was located northeast of San Antonio on El Camino Real de los Tejas and had the strong freshwater Comal Springs, known as Las Fontanas, when the Germans arrived. It was about halfway between Indianola and the lower portions of the Fisher-Miller land grant. The first settlers forded the Guadalupe River on Good Friday, March 21, 1845, near the present-day Faust Street bridge. As the spring of 1845 progressed, the settlers built the "Zinkenburg", a fort named for Adelsverein civil engineer Nicolaus Zink, divided the land, and began building homes and planting crops. Prince Solms would also lay the cornerstone for the Sophienburg, a permanent fort and center for the immigrant association. In 1844, Prince Solms was so disillusioned with the logistics of the colonization that he asked the Vereins to remove him as commissioner-general and appoint a successor. When John O. Meusebach arrived, the finances were in disarray, due in part to Prince Solms' lack of business experience and his refusal to keep financial records. To a larger degree, the financial situation happened because the Adelsverein was an organization of noblemen with no practical backgrounds at running businesses. They were on the other side of the world and did not witness the situation with which both Prince Solms and Meusebach were dealing. Henry Francis Fisher had not supplied transport and supplies for which the Verein advanced money to him. Meusebach found Prince Solms in Galveston trying to return to Germany, detained by authorities for unpaid bills. Meusebach made good on the debts, so Prince Solms could depart. Meusebach discovered that Prince Solms' choice of the inadequate Carlshafen (Indianola) as a port of entry, as well as the isolated route to New Braunfels, was deliberately chosen to keep the Germans from interacting with any Americans. According to Nicolaus Zink, Prince Solms had planned to establish a German feudal state by secretly bringing in immigrants and placing them in military fortresses. Meusebach, who had renounced his own title of nobility, took a different approach and invited Americans to settle in the Vereins territory. Prince Solms, being an officer of the Imperial Army of Austria, had kept a uniformed military unit at the ready in Indianola. Meusebach converted the military unit to a more needed work detail. A finance and business structure for the colony was put in place by Meusebach. He also provided for adequate food and shelter for the colonists. On August 11, 1845, Hermann Friedrich Seele became the first teacher for the German-English school in New Braunfels. Meusebach established friendly relations with a local tribe of Waco Indians. Upon seeing his reddish-blonde hair, they called him Ma-be-quo-si-to-mu, "Chief with the burning hair of the head". In May 1846, Meusebach received a letter from Count Castell informing him 4,304 emigrants were on their way to Texas. With no funds and no new settlements, the mass of emigrants was stalled at Carlshafen. Meusebach's requests to the Verein for more money, and his warnings of pending bankruptcy for the Verein, brought no results. As a last resort, Meusebach instructed D.H. Klaener to publish the plight in the German news media. Embarrassed by the publicity, the Verein established a $60,000 letter of credit. The amount was not adequate for sustaining the total number of German emigrants in Texas, but Castell also sent Philip Cappes as special commissioner to observe the situation. Cappes had also been instructed by Castell to observe Meusebach and to secretly report back every detail. By the time Cappes departed in March 1847, he recommended another $200,000 be advanced. Cappes invited Henry Francis Fisher to New Braunfels, in spite of Fisher not being entirely trustworthy to the Verein. As of February 11, 1845, Fisher had been involved in coercing newly arrived immigrants to sign documents stating their intent to depart from the Verein and align with Fisher's friend Dr. Friedrich Schubbert, also known as Friedrich Strubberg. Cappes was not in town when Meusebach was breakfast host to Fisher on December 31, 1846. Posters had mysteriously appeared about town maligning Meusebach, saying "Curses upon Meusebach the slave driver", and inciting colonists to free themselves from his "tyranny". A group led by Rudolph Iwonski pushed their way into Meusebach's home, and colonist C. Herber brandished a whip. Herber was an alleged counterfeiter to whom Count Castell had awarded asylum. Meusebach and Herber shared a dislike of one another. The colonists' list of demands included Meusebach resigning as commissioner-general and turning the colonization over to Fisher. Meusebach kept his composure, but the group became so heated, they yelled, "Hang him!" When the estimated 120 men dispersed, Fisher was nowhere to be found. The same evening, a different group of individuals assembled and pledged to stand by Meusebach, the next day passing resolutions condemning the actions of the mob. Meusebach himself had considered leaving Texas as early as November 1845, when he wrote to Count Castell and announced his intention to resign and return to Germany. Meusebach did not feel the Adelsverein was organized enough to achieve its goals. After the mob visit in New Braunfels, he again submitted his resignation to accompany a financial report to Castell on January 23, 1847. Meusebach had arranged with the Torrey Brothers for transporting the emigrants inland, but the United States hired the Torrey Brothers for use in the Mexican–American War. Meusebach stabilized the community's finances, and encouraged the settlers to establish additional neighboring communities. The largest of these secondary settlements was Fredericksburg, 80 miles (130 km) to the northwest of New Braunfels. New Braunfels thrived, and by 1850, it was the fourth-largest city in Texas, with 1,723 people, following only Galveston, San Antonio, and Houston in population. In 1852, the Zeitung newspaper was established, edited by German Texan botanist Ferdinand Lindheimer. The newspaper continues to publish under its current name, the Herald-Zeitung. New Braunfels is located in southeastern Comal County. The city is 32 miles (51 km) northeast of Downtown San Antonio, 19 miles (31 km) southwest of San Marcos, and 48 miles (77 km) southwest of Austin. According to the United States Census Bureau, New Braunfels has a total area of 44.9 square miles (116.4 km2), of which 44.4 square miles (115.1 km2) is land and 0.5 square miles (1.3 km2), or 0.91%, is covered by water. The city is situated along the Balcones Fault, where the Texas Hill Country meets rolling prairie land. Along the fault in the city, a string of artesian springs known as Comal Springs gives rise to the Comal River, which is known as one of the shortest rivers in the world, as it winds 3 miles (5 km) through the city before meeting the Guadalupe River. 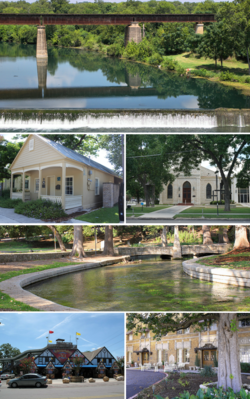 New Braunfels experiences a humid subtropical climate, with hot summers and generally mild winters. Temperatures range from 83 °F (27.8 °C) in the summer to 49 °F (9.4 °C) during winter. The city is served by the New Braunfels Independent School District and the Comal Independent School District. Five high schools are located within city limits, as well as a freshmen center. The public high schools are New Braunfels High School, Canyon High School, and Alamo Colleges-Memorial Early College High School. New Braunfels Christian Academy, a K-12 institution, and the Calvary Baptist Academy are private schools in the city. John Paul II Catholic High School is in nearby Schertz. NBISD operates several schools in New Braunfels. Gruene Historical District is located within the city limits of New Braunfels. Founded by the sons of settlers Ernst and Antoinette Gruene, the community had a bank, post office, school, general store, lumberyard, gristmill, dance hall, and cotton gin. It also had access to two railways for shipping cotton bales. Its most famous attribute was the dance hall, a family activity in those days. Due to the failure of the cotton crop from boll weevils, and the failure of the banks after 1929, commercial activity slowed to a crawl. This village is now a Nationally Registered Historic District where one can dine in the ruins of the original gristmill or enjoy live music at Gruene Hall. The community may also be researched through the Sophienburg Museum and Archives. As of the census of 2000, 36,494 people, 13,558 households, and 9,599 families resided in the city. The population density was 1,247.7 people per square mile (481.7/km2). The 14,896 housing units averaged 509.3 per square mile (196.6/km2). The racial makeup of the city was 84.30% White, 1.37% African American, 0.55% Native American, 0.58% Asian, 0.03% Pacific Islander, 10.93% from other races, and 2.24% from two or more races. Hispanics or Latinos of any race were 34.52% of the population. For the year 2015, New Braunfels was named the U.S.’s second-fastest growing city with a population of 50,000 or more, according to estimates by the U.S. Census Bureau. Of the 13,558 households, 33.4% had children under the age of 18 living with them, 55.4% were married couples living together, 11.5% had a female householder with no husband present, and 29.2% were not families. About 24.8% of all households were made up of individuals, and 12.0% had someone living alone who was 65 years of age or older. The average household size was 2.60 and the average family size was 3.11. In the city, the population was distributed as 25.7% under the age of 18, 8.5% from 18 to 24, 28.4% from 25 to 44, 20.6% from 45 to 64, and 16.9% who were 65 years of age or older. The median age was 36 years. For every 100 females, there were 91.9 males. For every 100 females age 18 and over, there were 88.3 males. The median income for a household in the city was $40,078, and for a family was $46,726. Males had a median income of $31,140 versus $23,235 for females. The per capita income for the city was $18,548. About 9.0% of families and 10.9% of the population were below the poverty line, including 14.9% of those under age 18 and 9.7% of those age 65 or over. Companies based in New Braunfels include Rush Enterprises. The town holds "Wurstfest", a German-style sausage festival, every November, drawing on the city's strong German heritage. Every December, the town celebrates Wassailfest in the historic downtown. New Braunfels draws a large number of tourists, particularly in the summer because of the cold-spring rivers that run through the city. Many generations of families and college students return every summer to tube for miles down the Guadalupe and Comal rivers. New Braunfels is the site of the original water park, the Schlitterbahn WaterPark Resort. The Ernest Eikel Skate Park attracts many skate board enthusiasts. The newspaper Herald Zeitung was originally two newspapers: The Herald (published in English) and The Zeitung, which means "newspaper", (published in German) until 1967. The other newspaper publisher serving the city of New Braunfels is the TX Citizen, formerly the NB citizen. In radio, two stations broadcast from New Braunfels, KGNB 1420 AM and KNBT 92.1 FM, notable for its Americana music format. Wikivoyage has a travel guide for New Braunfels. ^ a b "Geographic Identifiers: 2010 Census Summary File 1 (G001): New Braunfels city, Texas". U.S. Census Bureau, American Factfinder. Retrieved August 4, 2015. ^ Bureau, U.S. Census. "American FactFinder - Results". factfinder.census.gov. Retrieved 2018-08-23. ^ "Comal Springs". Edwards Aquifer. Retrieved 27 December 2010. ^ Brune, Gunnar. "Comal Springs". Handbook of Texas Online. Texas State Historical Association. Retrieved 27 December 2010. ^ Brune, Gunnar; Besse, Helen C (2002). Springs of Texas: Volume I. TAMU Press. p. 129. ISBN 978-1-58544-196-9. ^ "Faust Street Bridge". Texas Escapes. Texas Escapes – Blueprints For Travel, LLC. Retrieved 27 December 2010. ^ a b Greene, Daniel P. "New Braunfels, Texas". Handbook of Texas Online. Texas State Historical Association. Retrieved 27 December 2010. ^ Ragsdale, Crystal Sasse. "Zinkenburg". Handbook of Texas Online. Texas State Historical Association. Retrieved 27 December 2010. ^ Blackman, Clyde T. "Sophienburg Museum and Archives". Handbook of Texas Online. Texas State Historical Association. Retrieved 27 December 2010. ^ Ragsdale, Crystal Sasse. "Nicolaus Zink". Handbook of Texas Online. Texas State Historical Association. Retrieved 3 January 2011. ^ Breitenkamp, Edward C. "Hermann Friedrich Seele". Handbook of Texas Online. Texas State Historical Association. Retrieved 27 December 2010. ^ "Monthly Averages for New Braunfels, Texas". The Weather Channel. Archived from the original on 2013-12-19. 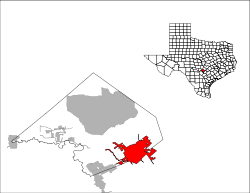 ^ Council District Map. City of New Braunfels. Retrieved on August 27, 2016. ^ Bowen, Greg. Census estimate ranks New Braunfels second fastest growing city in US, New Braunfels Herald-Zeitung, May 19, 2016. ^ "Carter Casteel's Biography". votesmart.org. Retrieved February 22, 2014. ^ Contact Us Charlie Duke Enterprises. Retrieved: 2012-09-03. King, Irene Marschall (1967). John O.Meusebach. University of Texas Press. ISBN 978-0-292-73656-6. Lich, Glen E (1996). The German Texans. University of Texas Press. ISBN 978-0-86701-072-5. Biesele, Rudolph Leopold (2008) . The History of the German Settlements in Texas 1831–1861. Eakin Press. ISBN 978-1-57168-857-6. Haas, Oscar (1983) . History of New Braunfels and Comal County, Texas 1844–1946. Solms, Carl; Gish, Theodore G; Von-Maszweski, Wolfram M (2000). Voyage to North America, 1844–45: Prince Carl of Solms' Texas Diary of People, Places, and Events. University of North Texas Press. ISBN 978-1-57441-124-9. Morgenthaler, Jefferson (2007). The German Settlement of the Texas Hill Country. Mockingbird Books. ISBN 978-1-932801-09-5. Johnson, David; Miller, Rick (2009). The Mason County ""Hoo Doo"" War, 1874–1902 (A.C. Greene Series). University of North Texas Press. ISBN 978-1-57441-262-8. Kattner, Lauren Ann (1991). "From Immigrant Settlement into Town: New Braunfels, Texas, 1845–1870". American Studies. 36 (2): 155–177. Wikimedia Commons has media related to New Braunfels, Texas.